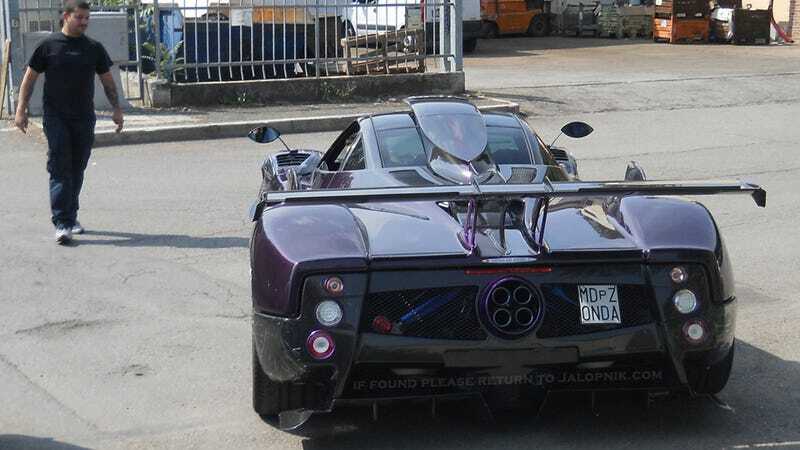 Is This Lewis Hamilton's New Zonda? Even though Pagani is building the Huayra now, they'll still make you a Zonda if you ask for one. That's what F1 star Lewis Hamilton did, comissioning a one-off version with 760 HP and manual gearbox. These are the first ever pics. Back in 2010 a lot of drawings came out for a new road-going version of the Zonda R called the Zonda 750. There had already been a road-version of the Zonda R called the Cinque, and the 750 was a customized version of that car. It was built for the Al-Thani family, the emiri family of Qatar, and it was purple. It appears very similar to the car you see here, but a friend of the Jalop states that this is, in fact, a unique car built specially for Hamilton. Breaking down the specs, this thing has a custom rear window, a unique roof scoop, and it has 760 horsepower. That's 71 more than the Cinque and on par with the most powerful Zonda of all, the 760RS. We never saw any live pictures of the 750 and a member of the Al Thani family stated on the Teamspeed forums that the car was cancelled in favor of a Grand Sport Bugatti. These pictures, sent in by a Jalopnik reader, show a car that looks strikingly similar to that 750, but is clearly new and undergoing final validation testing before being handed off to its new owner.